If you're in need of some inspiration look no further than the cards. 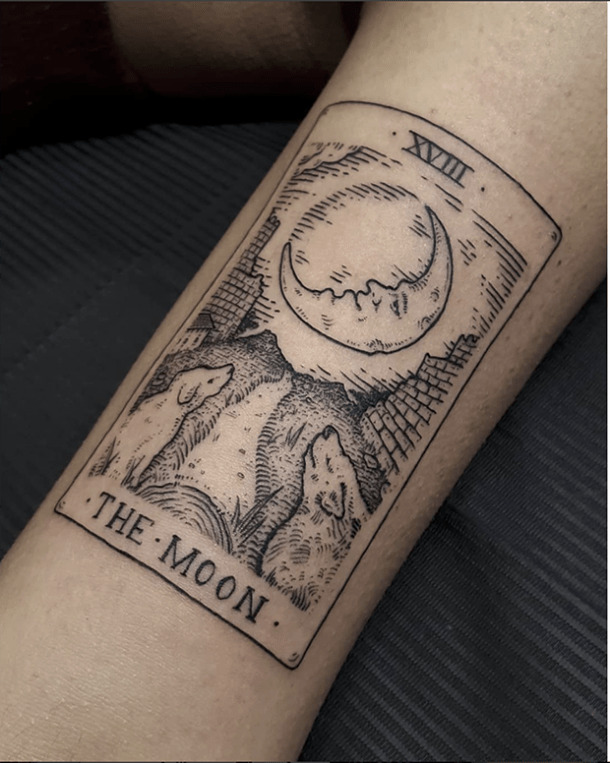 As 2018 comes to a close we welcome in the new year with good vibes and maybe even some new ink inspired by tarot cards. I’m not talking about stationary but rather a tattoo to symbolize a new chapter in your life. Sometimes you one just because you can get one. If that’s the case you might be thinking a thousand times over “what do I want?” The fact there are endless of possible pieces you could get inked make the decision process that much harder. Tattoos are one of the most committed relationships you’ll have in your life. If this is your first tattoo then do a little research before you head to the parlor. There’s an etiquette that must be followed and respected between you and the artist. At the end of the day you’re going to proudly wear that permanent piece. You have the power to show it off to the world or keep it to yourself. In the tarot cards, did you know a female walking a lion represents strength? It means you have the courage to over any obstacle to come your way. The Justice Tarot card show your objectivity to any situation. Tarot cards have an individual meaning unique to the person who pulls it. Their simple meanings are significant and can change the wave you’re riding in. 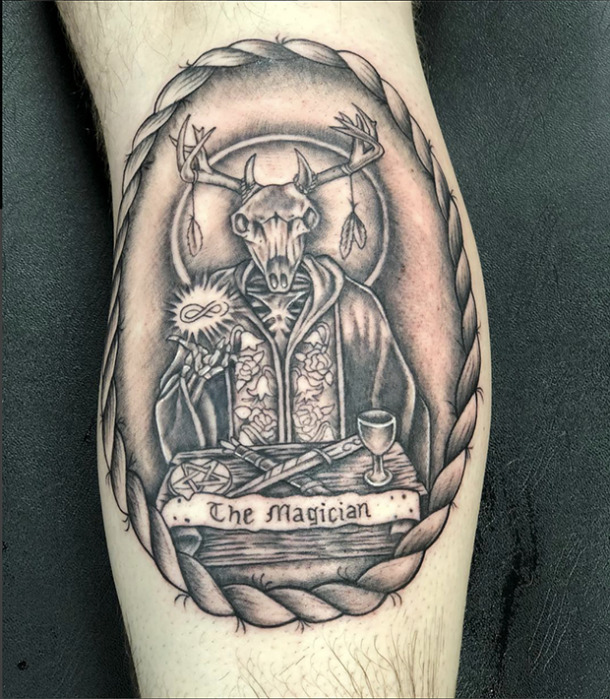 Nothing is set in stone and tarot tattoos can remind you that everyday. 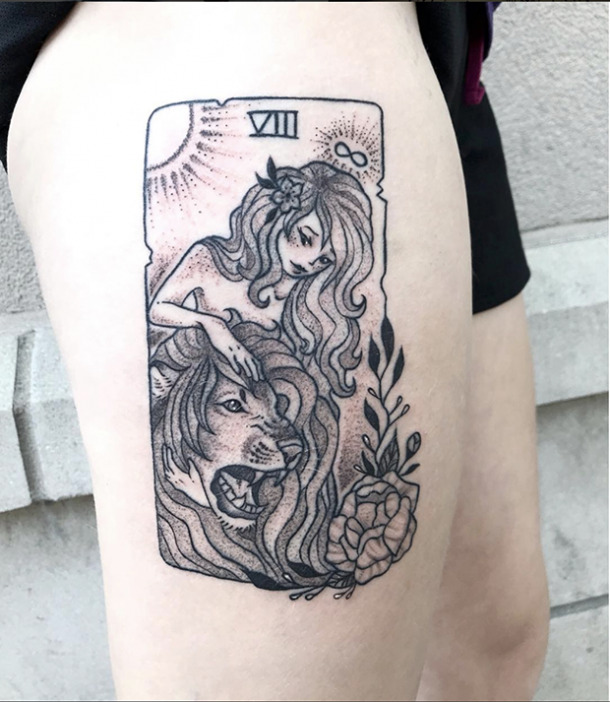 Tarot tattoos also come in many beautiful forms. The simple or intricate designs are a reminder of the beauty that comes with this life. You can have any design with your tattoo because of the endless possibilities of design. 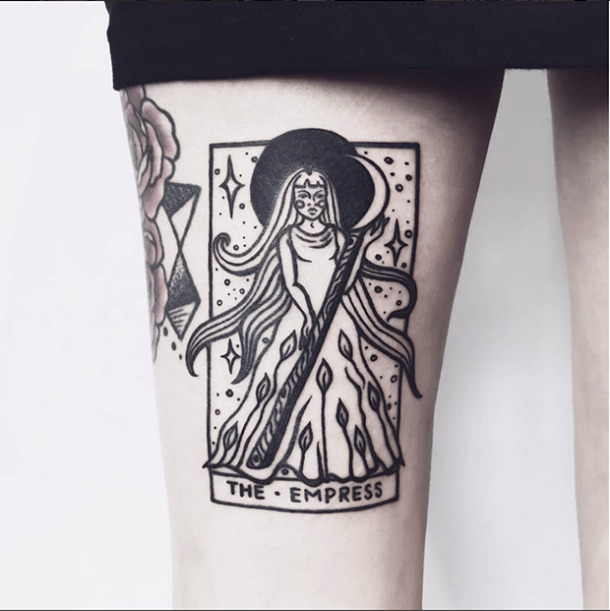 If you’re a veteran in the tattoo world or you’re new and still pondering for your next one, read further for 25 tattoo ideas based on Tarot cards. 1. The Star tarot card refers to hope, faith, purpose, renewal and spirituality. It’s about your connection to the otherworldly. 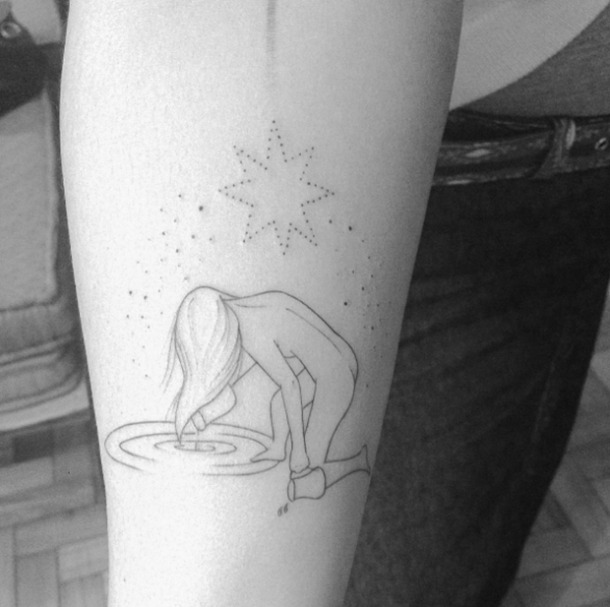 Get this tattoo if you're needing a little more whimsy in your life. If you need a reminder to always have faith this is the perfect signature for you. 2. 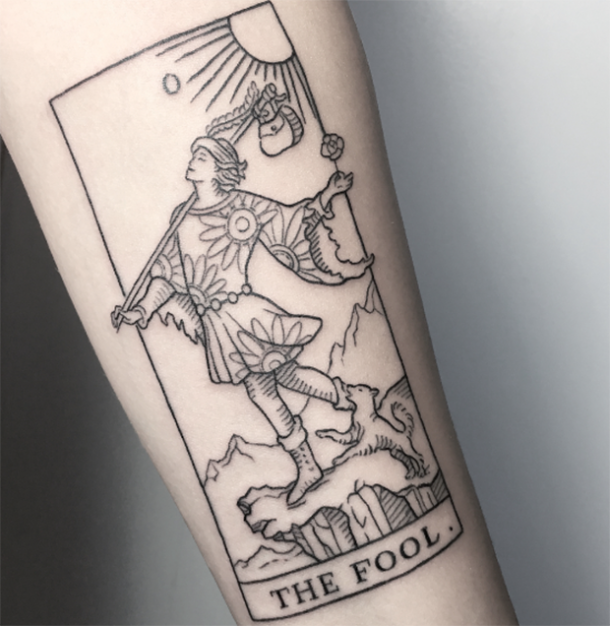 The Fool tarot card tattoo shows new beginnings and having faith in the future. They are inexperienced and always down for an adventure. They have beginner's luck, the skill of improvisation and they believe in the universe. Perfect for anyone who wants to carry a little luck with them. 3. 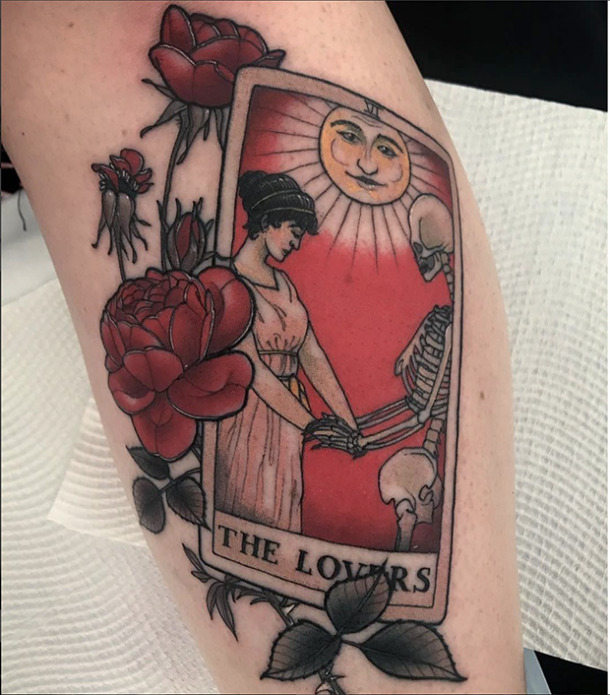 The Lovers tarot card illustrates all relationships. Whether it be following lust or love, the Lovers will show you the direction your romantic life will lead to. It’s usually shown with two bodies. Get this ink when you're in need of reminding that love is the greatest thing we do. Love is powerful and it will guide your way. 4. The Strength tarot card shows your ability to remain cool and collected in moments of high stress. It represents your will and power to conquer any difficulty. Sometimes we're all in need of strength. We need to be shown that we are strong enough to get through any moment of difficulty. 5. 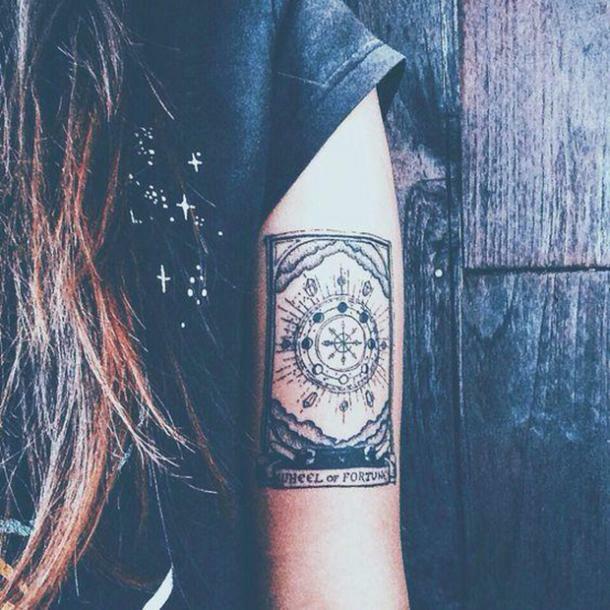 The Wheel of Fortune tarot card tattoo refers to a change in your life. For example, going from rich to poor or visa versa. It may also refer to items not related to money too. ​This tattoo is perfect for anyone who wants to change the meaning of wealth in their life. 6. The Chariot tarot card represents the conquering of hardships and conflict, moving forward in the right direction. This card refers to how only through hard work may one overcome any obstacle on life. ​Similar to Strength, the Chariot tattoo will point you to where you need to go and give you the power to do so. 7. The Magician tarot card encourages one to dig deep and tap into the full potential one may be holding back on. It refers to talents and capabilities that may be hidden and in need of unearthing in order to positively enact change in one’s life. ​If you ever need a reminder to take risks and unearth your passions, take a chance on the Magician for that. 8. 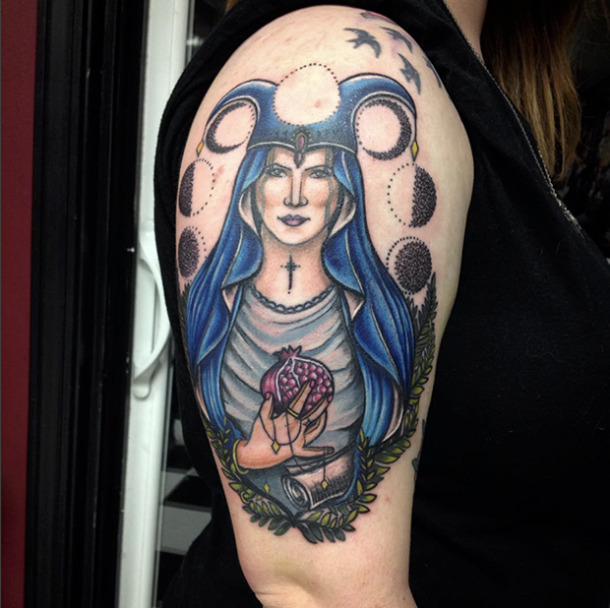 The High Priestess tarot card tattoo encourages reflection upon oneself. This emphasizes to trust one’s instincts in order to get through questioning times. ​A tattoo like this will provide you with the instinct to trust yourself even when you can't. 9. 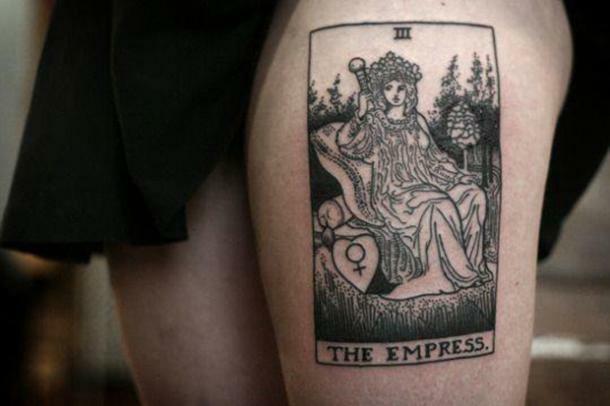 The Empress, with her strong female presence, can represent love, new business, or the creation of a family. It shows that the only person who can captain their life ship is themselves. It refers to never forgetting that you have the most power and will to change your life. ​Get this tattoo when you need to reminded that you can change your life and only you have the power to do so. 10. The Death tarot card doesn’t necessarily mean a physical death. It may refer to the end of a relationship or pursuit. With that, Death also brings a new sense of self-awareness, showing one that the end might not always be a bad thing. Death means gaining knowledge about the relationships and connections that have ended. Getting this ink means you're okay with what may come to an end because you'll garner more knowledge about the experience. 11. The Justice tarot card demonstrates that the fairest decision will be made. The sword cuts through any bias and will not be swayed when determining the most objective outcome. 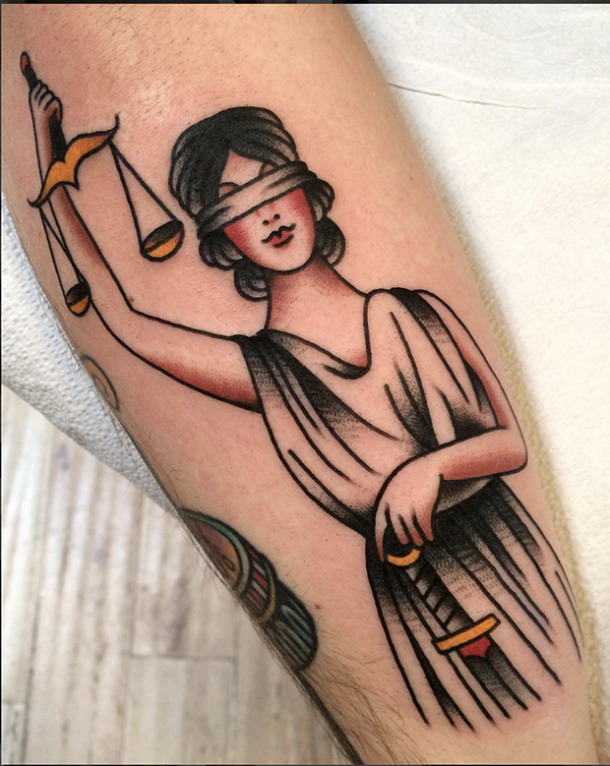 The justice tattoo will remind the wearer that the best decisions should be the one that's equal to all parties. 12. The Sun tarot card is a time for celebration, joy and positivity. It shows our truest happiness when we are most in tune with our needs and wants. Get this tattoo if you need a little more light in your life. 13. The Moon tarot card refers to the many possibilities of life. There are multiple choices and paths in decision making. However, your intuition will guide you in the right direction. The Moon wearer will always be reminded of the infinite choices in life. 14. 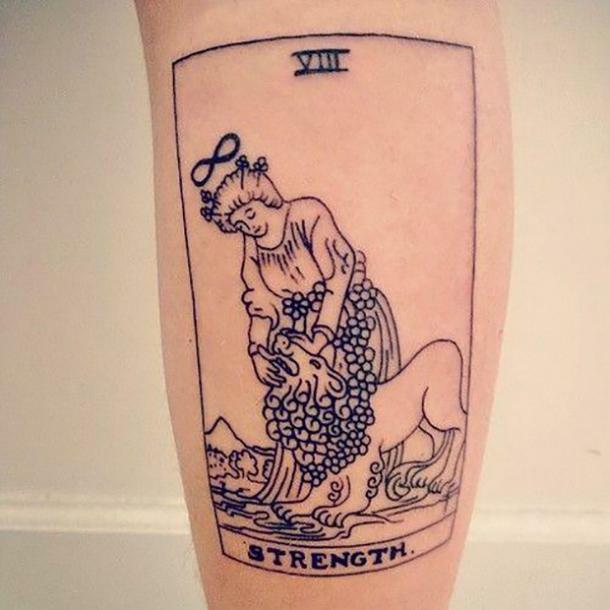 A more feminine thigh tattoo of the Fool tarot. 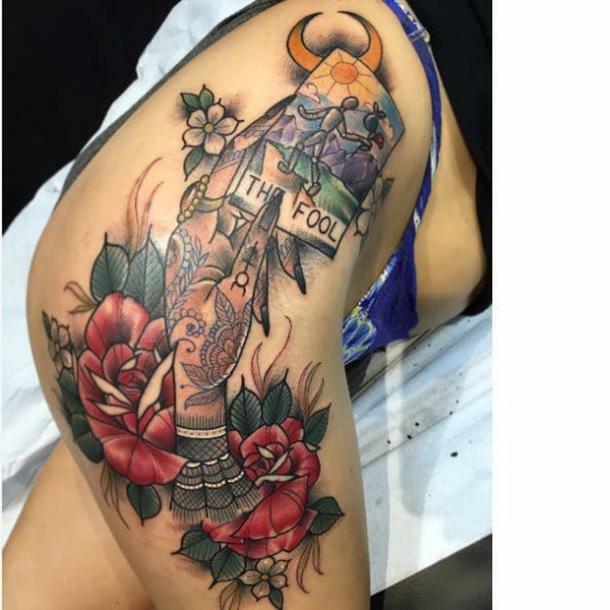 The vibrant colors show case the beauty behind the Fool's tattoo. 14. The Emperor suggests stability and security in your life. Get this ink to remind yourself of the discipline and self control that helped you get this far in life. 15. Bold black ink to show off the Moon. 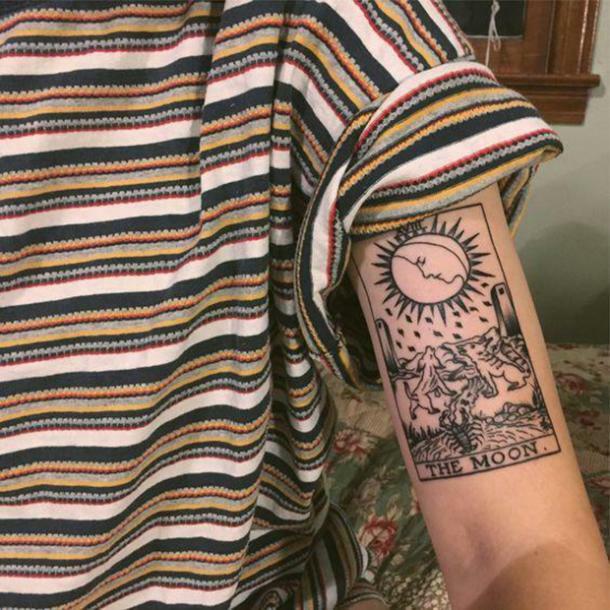 A simple design showing the moon watching over those who worship it. 16. 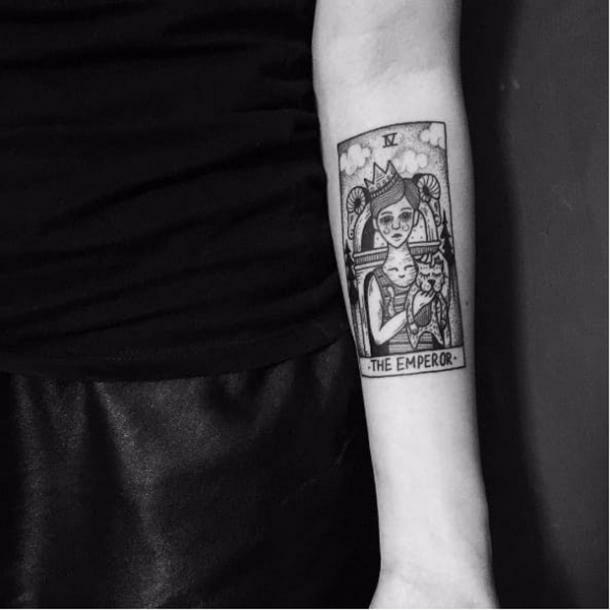 The female energy is strong with this Empress tarot card tattoo. The line work is intricate and shows the detail in something so meaningful. 17. 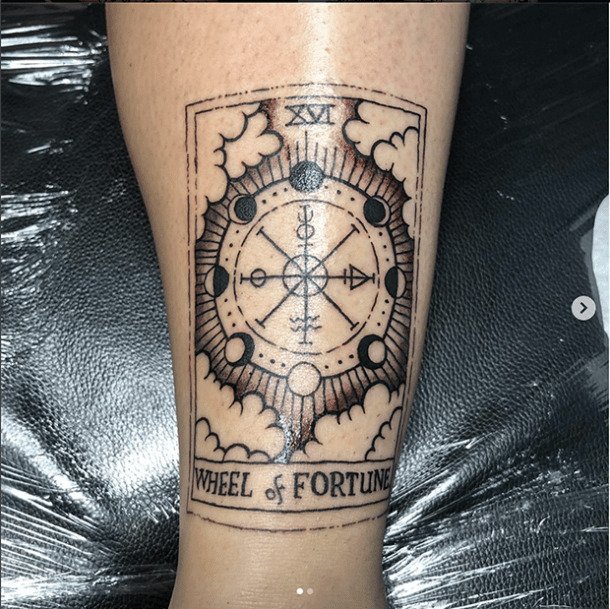 The Wheel of Fortune tarot card tattoo can always be spun more than once. Try this Wheel of Fortune Tattoo in black ink for a bold statement. 18. 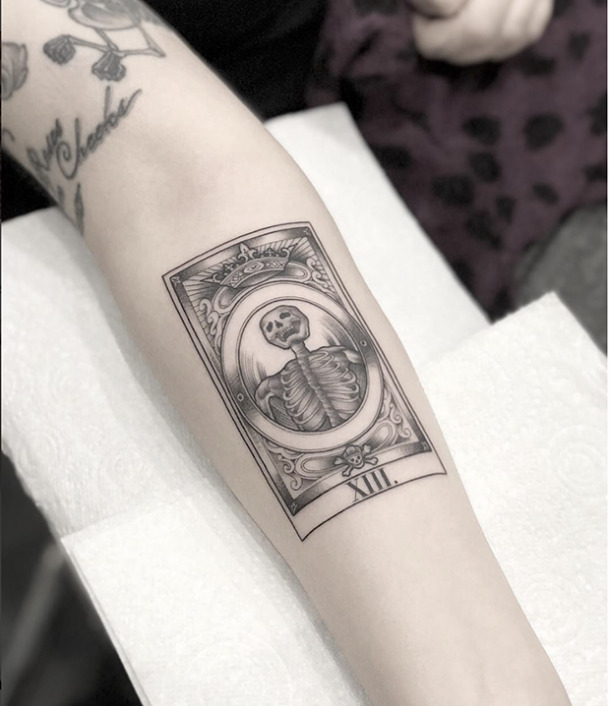 A simple Strength tarot card tattoo design with black ink. The lion is always paired with a female companion to show the strength she always carries with her. 19. 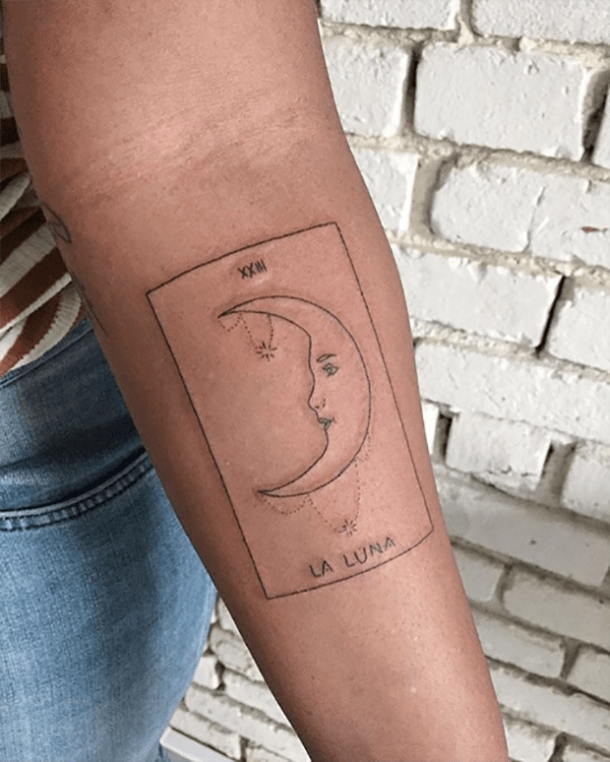 The Moon tarot card tattoo drawn with thin lines on the forearm. Simple designs to get the message across. Beautifully crafted! 20. 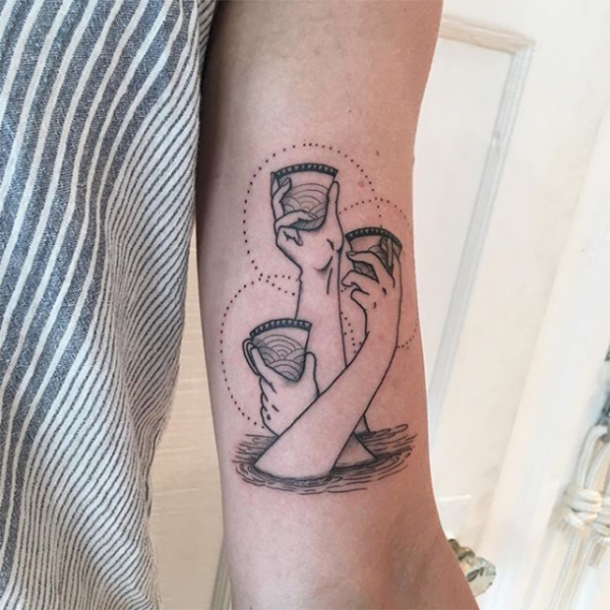 Three of Cups tarot card tattoo! Cheers to the good things in life. 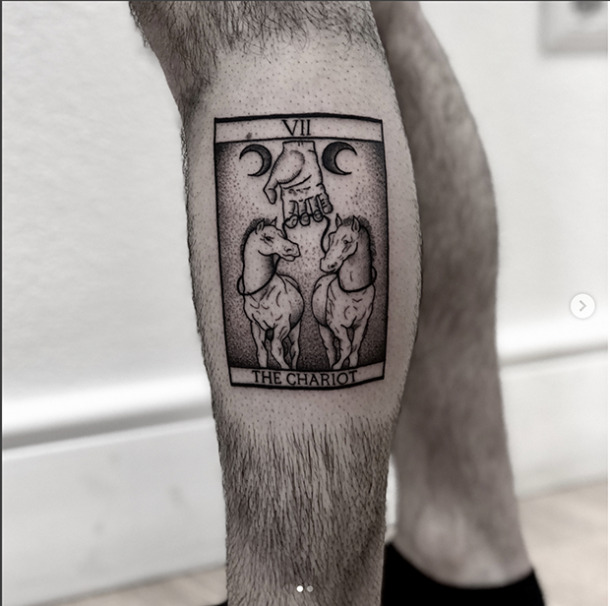 This tattoo symbolizes the greatness of friendship and successful creative events. Get this tattoo to remind yourself to enjoy the little or big victories in life. 21. Both the Moon and Strength collide in this piece. 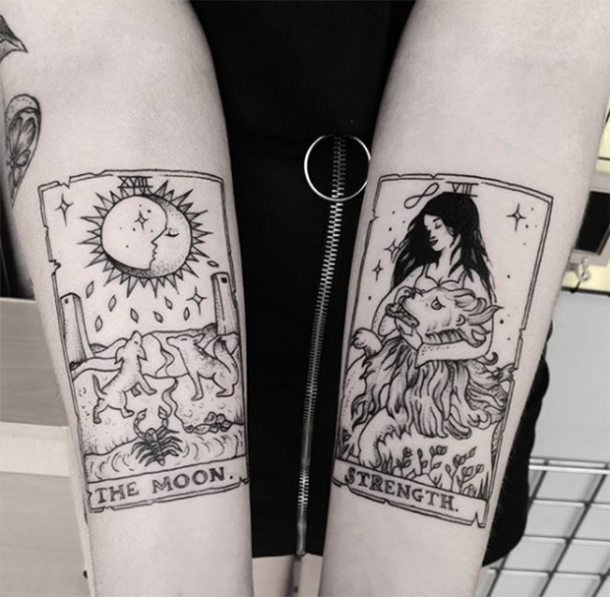 These tattoos show the power in duality. Not just one card but two and it shows the wearer having power with both. 22. 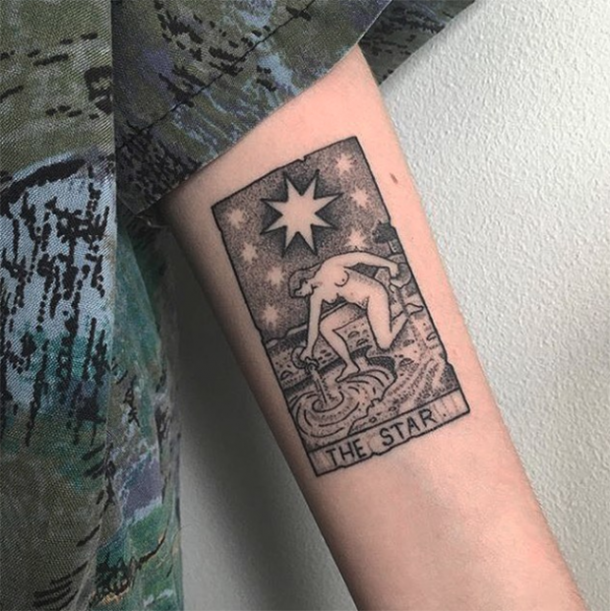 Shine bright like Star tarot card tattoo. The Star represents hope and a restoration in faith. Get this tattoo if you need a little reminder to always look on the brighter side of a situation. 23. Incorporate Latin in your tattoo for strength. 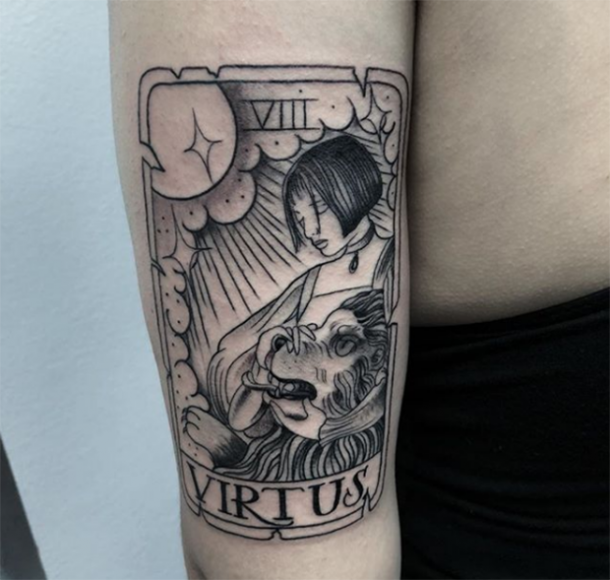 Courage and worth are some of the phrases connected with virtus! 24. Simple and beautiful lines for the Fool tarot card. 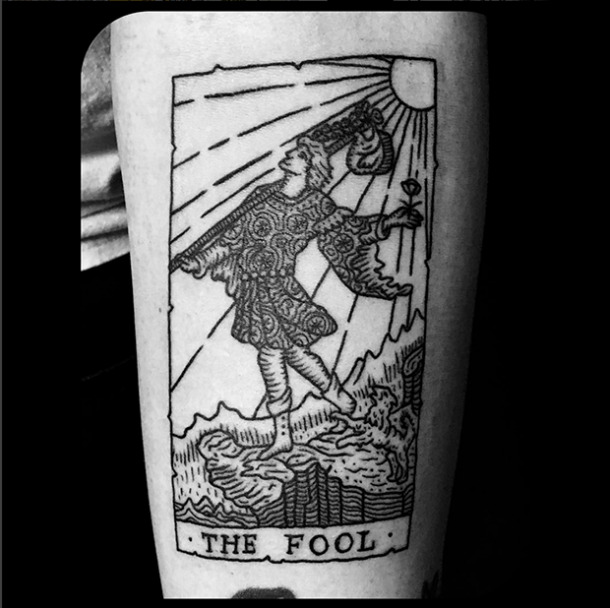 Another wonderfully designed tattoo for the Fool. 25. 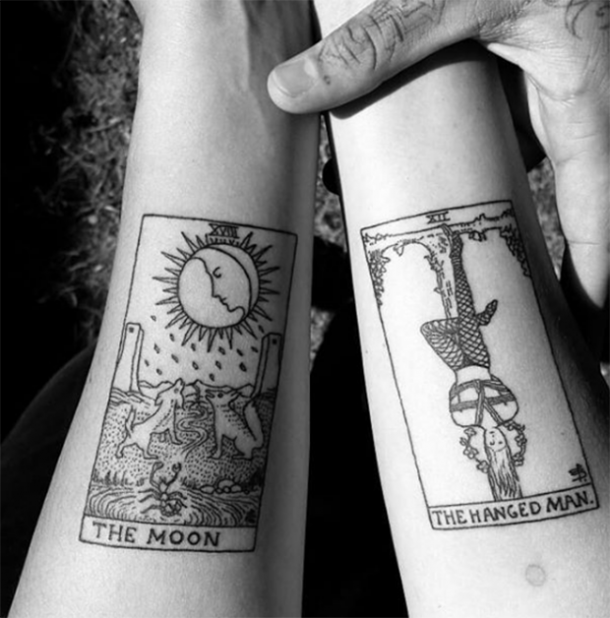 Dual tarot tattoos: The Moon and Hanged Man. The Hanged Man represents the ultimate sacrifice, surrendering yourself to whatever situation may need it. Every tattoo will be significant to the wearer and have a meaning personal to themselves. 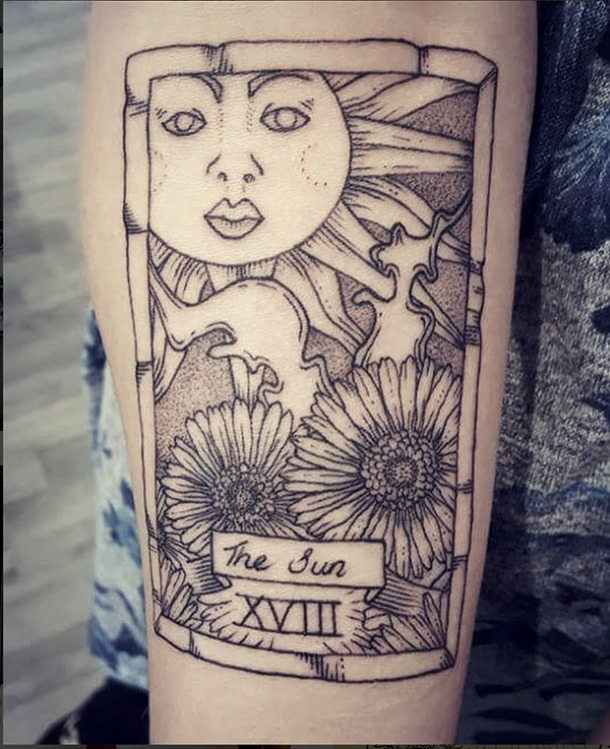 The beauty of a tarot tattoo will always remain. Isabella Ong is a writer who covers tarot, astrology, pop culture and relationship topics.